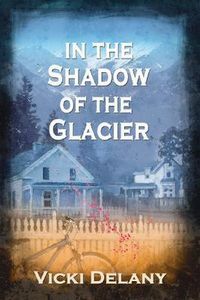 In the Shadow of the Glacier by Vicki Delany: Synopsis and Online Purchase Options. Synopsis (from the publisher): Trouble is brewing in the small, bucolic mountain town of Trafalgar, British Columbia. An American who came to Trafalgar as a Vietnam War draft dodger has left land and money to the town but there's a catch: the money must be used to build a garden to honor draft dodgers. This bequest has torn the close-knit, peaceful town apart. Then the body of a leading opponent is found in an alley, dead from a single blow to the head. Constable Molly Smith is assigned to assist veteran Detective Sergeant John Winters in the investigation. But Winters doesn't want the help of the enthusiastic rookie, and suspects that he's been assigned Smith for political reasons – her mother, a life-long activist, is the leader of the group arguing for the park.